"Professor River Song (born Melody Pond) was a "child of the TARDIS" and the wife of the Doctor, specifically his eleventh incarnation. She was mostly human, with some Time Lord DNA, conceived by her parents, Amy Pond and Rory Williams, aboard the TARDIS as it travelled through the Time Vortex, and then raised and conditioned by the Silence. (TV: A Good Man Goes to War) This gave her great strength, the ability to regenerate and a great understanding of the complex principles of time and space. 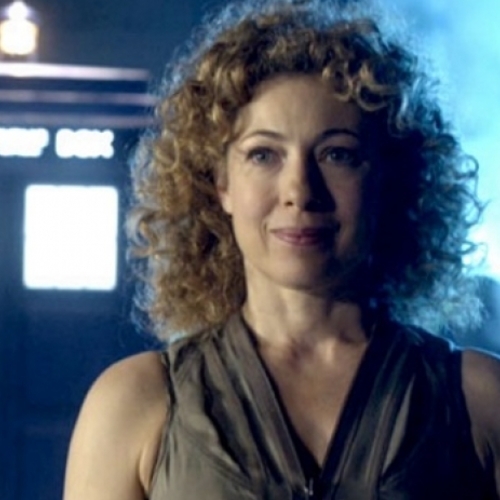 (TV: The Time of Angels, Day of the Moon, A Good Man Goes to War, The Wedding of River Song) She loved the Doctor, and shared a long-lasting relationship with him. River was one of the very few people who knew the Doctor's true name. (TV: Forest of the Dead, The Name of the Doctor)"
(Emotional) [speaking to the handcuffed Doctor, as she realizes she must sacrifice her own life to keep the Doctor from sacrificing his]: Funny thing is, this means you've always known how I was going to die. All the time we've been together, you knew I was coming here. The last time I saw you, the real you — the future you, I mean — you turned up on my doorstep, with a new haircut and a suit. You took me to Darillium to see the singing towers. Oh, what a night that was! The towers sang and you cried. You wouldn't tell me why, but I suppose you knew it was time. My time. Time to come to the Library. You even gave me your screwdriver; that should've been a clue. [The Doctor tries unsuccessfully to reach their sonic screwdrivers] There's nothing you can do. When I first met the Doctor, a long, long time ago, he knew all about me. Think about that. An impressionable young girl, and suddenly this man just drops out of the sky, and he's clever, and mad, and wonderful, and knows every last thing about her. Imagine what that does to a girl. Trouble is, it's all back to front. My past is his future. We're traveling in opposite directions. Every time we meet, I know him more, he knows me less. I live for the days when I see him, but I know that every time that I do he'll be one step further away. The day is coming when I'll look into that man's eyes, my Doctor, and he won't have the faintest idea who I am. And I think it's going to kill me.